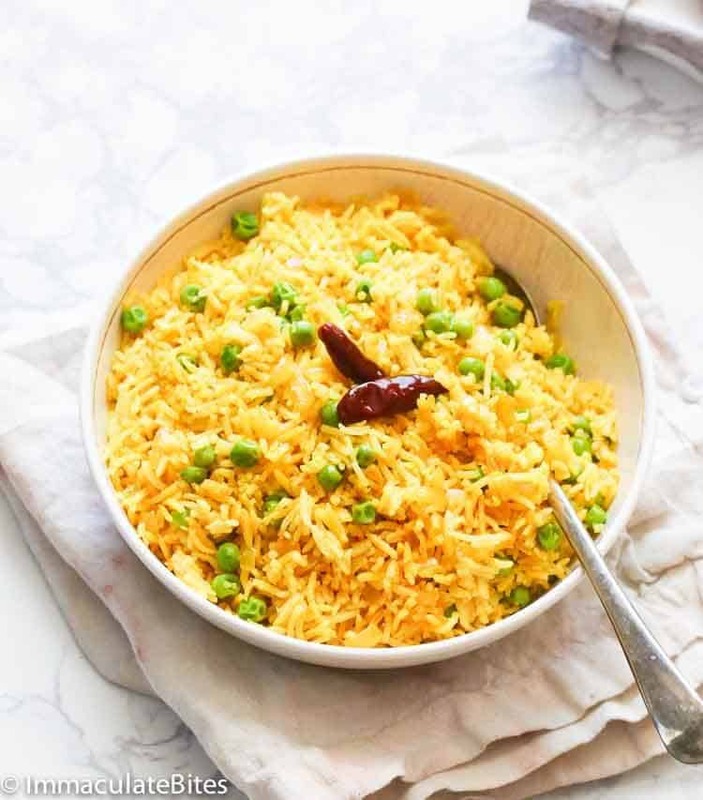 Yellow Rice – Two quick and simple to make yet super delicious rice dishes, Indian and South African style seasoned mainly with turmeric, ginger and curry powder for a taste bud sensation. A great accompaniment for kinds of curries, seafood and other meat dishes. Not to long ago I shared with you a recipe for brown spinach green rice. 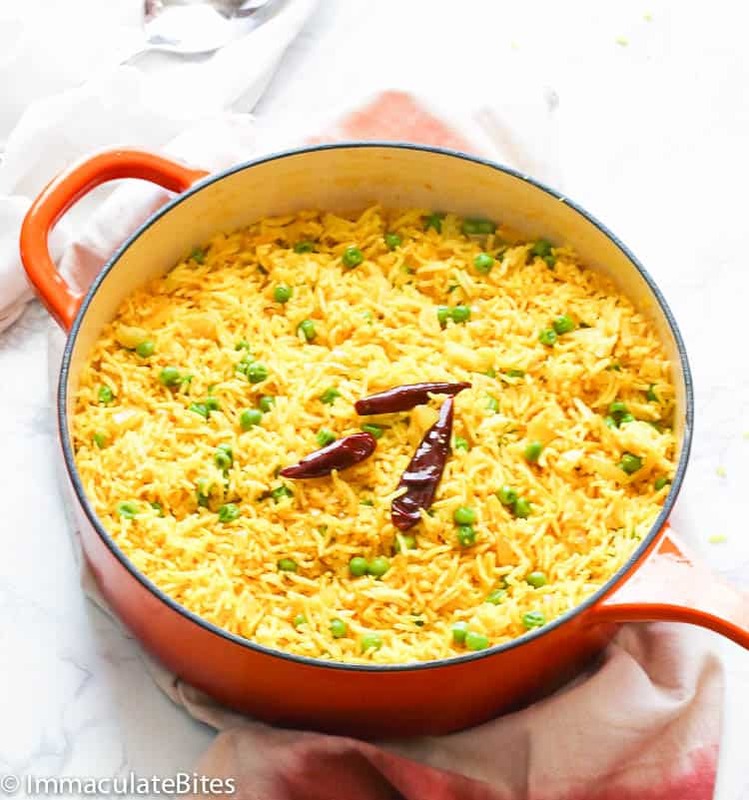 Since then, it has become my go-to rice recipe and to put it mildly – the whole family is obsessed with it. One of my resolutions this year was not get into a cooking rut. So I have decided to switch things up a little bit and make another kind of rice. My heart was set on Cape Malay Version of yellow rice. 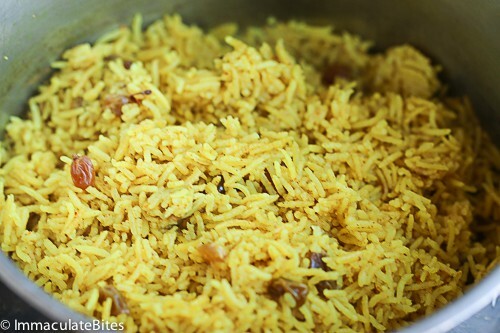 Yellow Rice is a popular traditional yellow-colored rice dish in cuisines like Spanish, Caribbean, Indian, Indian and South African, among others. It is usually made by mixing white rice with saffron or turmeric to give off a yellow color. Turmeric is a hate or love spice – you either hate it or love it. It has a peppery, warm and somewhat bitter flavor with a light fragrance. 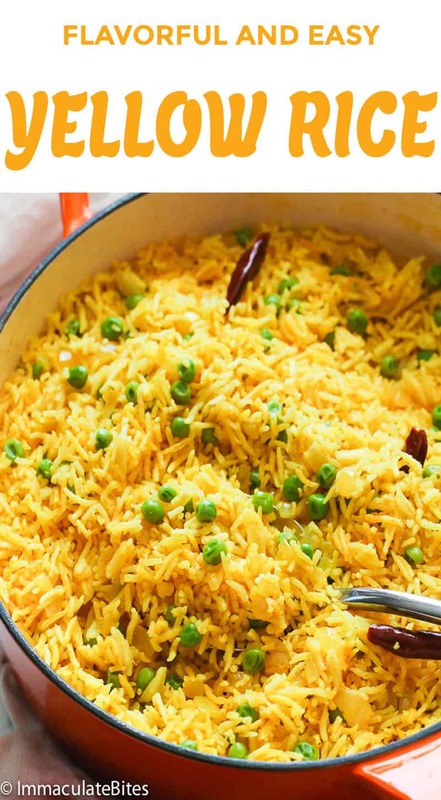 So I start out wanting to make a traditional south African dish and then ended up with a Cuban/ Indian style yellow rice (as seen above). Then I decided to take my behind back to the kitchen and make what I had set out to make, because sometimes I shy away from using certain ingredients in a recipe. In this case, it was adding raisins and sugar to a savory rice side dish. After making it, I kinda like it! The turmeric, curry and ginger, mellows out the sugar and you are left with a simple flavorful and aromatic side dish. Try both recipes of yellow rice and you decide which one you prefer. Is yellow rice bad for you? Most of those yellow rice boxes and packages that you can buy from the grocery stores were heavily loaded on with chemicals, additives and MSG. So technically, that type of yellow rice is bad for you when you obsess yourself with it. When cooking with spices I like to start by sautéing the spices so they can bloom. It really makes the dish taste a lot better. However, if you do want to lift a finger and do any extra work, the super duper easy way to make this rice is just throwing everything in a pot, bring to a bowl and let it simmer for about 18 minutes (a rice cooker works fine too). If you like plump raisins soak them in warm water first for about an hour before cooking. Serve it with your favorite protein or with this other South African favorite bobotie. 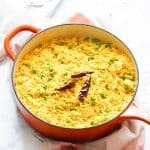 Yellow Rice - Two quick and simple to make yet super delicious rice dishes, Indian and South African style seasoned mainly with turmeric, ginger and curry powder for a taste bud sensation. A great accompaniment for kinds of curries, seafood and other meat dishes. Heat a saucepan with oil/ butter. Then add, ginger, turmeric, curry, and brown sauté for about a minute. Heat a saucepan with oil, then add onions, garlic, ginger , paprika, curry pepper, cayenne pepper, and white pepper sauté for about a minute. Stir in rice to the pan, about 2 minutes, then add 4 cups of stock/water, bring to a boil reduce heat, and simmer until rice is almost cooked- about 10-12 minutes into cooking. Then throw in the peas, cover and continue cooking, for a few more minutes until rice is completely cooked. You may add more stock if needed. Fluffy and serve. If you like plump raisins soak them in warm water for about an hour before cooking. 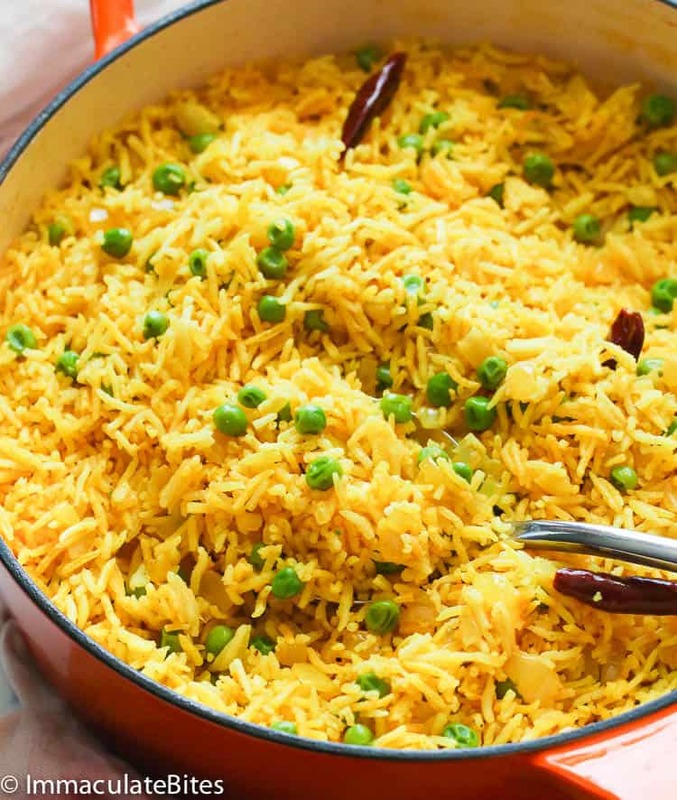 Indian Style Yellow Rice. Heat a saucepan with oil, then add onions, garlic, ginger , paprika, curry pepper, cayenne pepper, and white pepper sauté for about a minute. Stir in rice to the pan, about 2 minutes, then add 4 cups of stock/water, bring to a boil reduce heat, and simmer until rice is almost cooked- about 10-12 minutes into cooking. Then throw in the peas, cover and continue cooking, for a few more minutes until rice is completely cooked. You may add more stock if needed. Fluffy and serve. South African Yellow Rice. Heat a saucepan with oil/ butter. Then add, ginger, turmeric, curry, and brown sauté for about a minute. Stir in rice to the pan, about 2 minutes. Then add 4 cups of stock/water and raisins bring to a boil. Then reduce heat, and simmer until rice is completely cooked- about 18- 20 minutes. As the rice cooks you may add more stock if needed. Fluffy and serve. I made a variation of your indian style yellow rice. I used your recipe for inspiration on what ingredients to use, but in the end I didn’t necessarily use your measurements, I just kinda eyeballed everything. Came out good! Lol. I didn’t have a measuring cup, so maybe one day later I will try with the measurements and come back with an update! Thanks always for your flavorful recipes! I have tried several of your published recipes and really enjoy them. I especially like the fact you include the nutritional content for each recipe. I would like to know what is the serving size (in the Nutritional Facts section) for these recipes? Thank you for trying out my recipes. For this recipe, serving size is per 1 cup. I tried the South African rice with your recipe for paprika chicken legs and it was amazing!!!! This is now one of my go-to dinners. So glad I decided to try this. The rice was perfectly flavored. I used golden raisins cuz that’s what I had and it was a perfect balance. Thanks for this! What an incredible chicken and rice combo! Thank you for taking the time to share this with me, Vanessa. Have a good one! Thank you for sharing this, I had forgotten about this recipe until I saw it today. It brings back some wonderful memories. 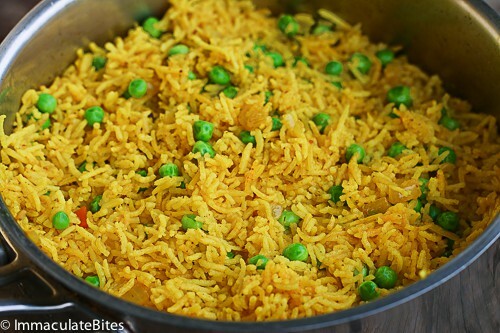 I am going to make this for my family next weekend for our family get together, as my Dad loves Yellow Rice. Looking forward to hear how this one turned out for you, Samantha. Enjoy! I was wondering if the rice needs to be boiled or washed a few times to remove the starch? My husband will not eat rice if he taste the starch, so I usually will boil the rice for a few minutes until the water is cloudy. I then rinse the rice and then add fresh water. I would think rinsing the rice à few times should be enough. Hi Grace, I think washing a couple of times should do it .let me know how it works out for you. Thanks ! I am having several issues cooking the rice. This is in regards to Jollof, Check rice and the Pilaf rice as well. The rice is too soft and very soggy. Which rice is the best to use? I usually use Jasmine rice but would Basmati rice be better? If your rice is too soggy then it might be too much water and/or prolonged cooking time . Although I prefer Basmati rice jasmine rice works as well here. For the check rice try uncle bens. Drooling, you legit have me drooling right now! I’m excited I found your site because our friends are from South Africa. We are hosting them soon to make dinner together. They are making traditional South African dishes and I’m in charge of the side dish. I’m totally going to make this recipe for them! Thanks Christina! Do let me know how it works out ! 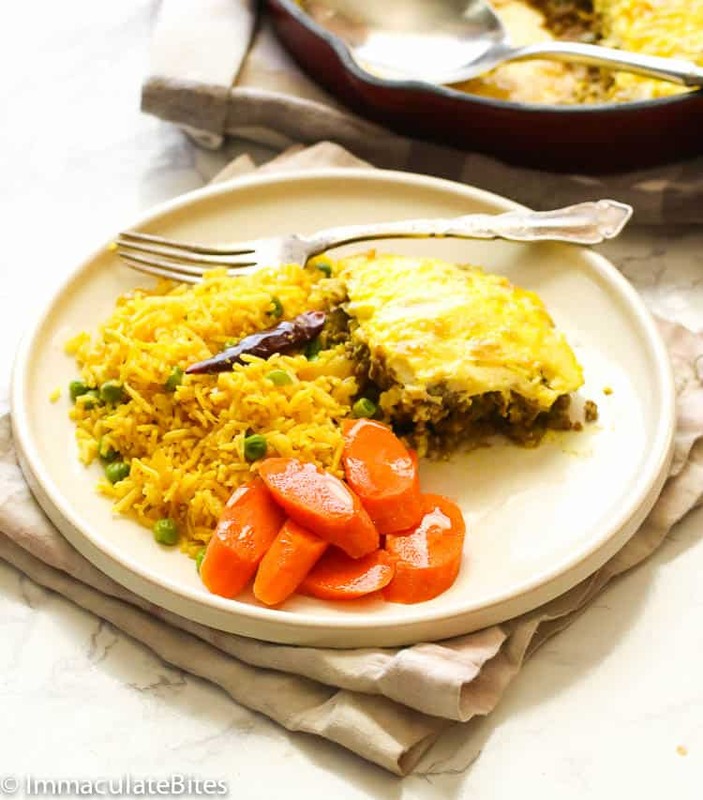 We use the rice with peas recipe and it is so good! I use the recipe as it is and I’ve modified it and it still tastes amazing. One of those recipes that really can’t go wrong. Thank you! Agree you just can’t mess it up! Thanks for letting me know how it worked out for you. Making the Indian one today! I noticed that salt an turmeric are not in the Indian rice instructions. I am a new fan of your blog. Thank you for your great recipes! Hi Are! Seasoned with salt according to preference . Use about 1 teaspoon of tumeric powder. Happy Cooking!!! Hi Imma! I am currently stewing the Jamaican Oxtail Curry. It is smelling delicious! Which version of the rice do you think would match best? Caribbean rice and beans would be just Perfect. Happy Cooking!!!! Just found your site, SO happy I did! So Happy you are here Diona! Good evening! Just came across this..yum! Is the rice parboiled or raw rice that was added please? The stories, the steps,the food,the pictures …. All to die for. Well done! Thanks Binta. No parboiling needed. I must begin by saying I usually don’t leave reviews on recipe blogs. But holy cannoli. You’re a culinary genius. This is, hands down, the best rice I have ever had. Anywhere. Ever. I made the Indian style version and followed the recipe exactly. My husband said it’s one of the best things I have ever made. You have made two people very happy. Thank you. Aww….I am so honored that you would make the exception for me. Tell hubby he’s got good taste. This looks so delicious and I can’t wait to try it! I wonder how it will taste if I use brown rice instead as our family does not really eat white rice . There will be a slight difference in taste but not overwhelming. Do let me know how it works out for you. I added some coconut milk to my yellow rice it tasted even better. Thanks for sharing that tip, Bernice. I tried it 🙂 Really good and was easy to make! 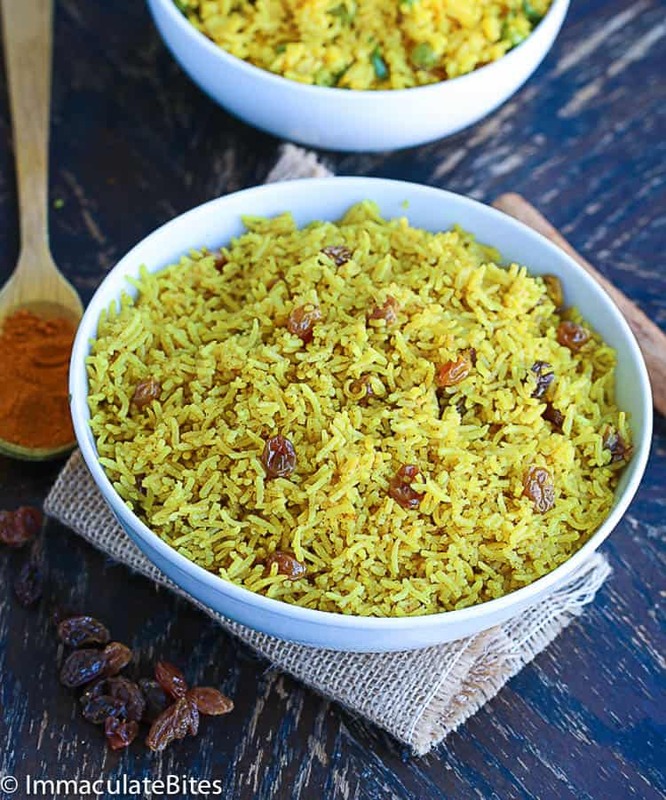 Yellow rice and raisins looks delicious. Chewing rice and having the raisins burst with all that juice… yum! I could totally eat BOTH those rices without anything else! I adore flavoured rices. IMMA you truly are killing me, I feel like I just need to set aside a month and just cook stuff from your blog. I just love your food SO much. Thanks for the nice recipe. Should the garlic and ginger be sliced or ground? It should be minced . Thanks. Hello! I'm Imma! Cooking up Exquisite African, Caribbean & Southern flavors with a flavorful twist You can too! In your kitchen. It's much more fun together. Join me . 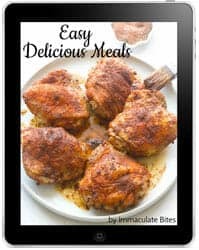 Plus get a free copy of our ebook Easy Delicious Meals!